Sydney Goodsir Smith was a significant figure in the 20th-century revival of poetry in Scots. His masterpiece, 'Under the Eildon Tree' (1948), comprising 23 variations on the subject of love, draws parallels between his personal experience and that of great lovers in history and mythology. It is one of the great love poems in Scots. Sydney Goodsir Smith spent his first years in New Zealand, then in 1928 moved with his family to Edinburgh. From the outset he chose Scots as the language for his poetry. Three collections appeared in the 1940s: 'Skail Wind' (1941), 'The Wanderer' (1944) and 'The Deevil's Waltz' (1946). A humorous novel, 'Carotid Cornucopius', followed in 1947. In the 1950s, with the publication of 'So Late Into the Night' (1952) 'Orpheus and Eurydice' (1955), and 'Figs and Thistles' (1959), he was hailed as the best Lallans poet after MacDiarmid. His play, 'The Wallace', was staged at the 1960 Edinburgh Festival. 'Kynd Kittock's Land' (1965) gives an affectionate portrait of Edinburgh. 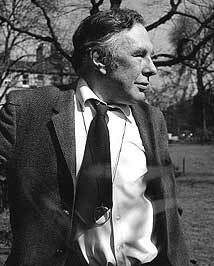 Sydney Goodsir Smith in the garden opposite his house in Drummond Place, Edinburgh, 1975. © Gordon Wright. For permission to use this image or to order a print or digital copy, e'mail Gordon Wright.